When new drugs are tested on humans, they can sometimes be ineffective, and sometimes deadly. Testing drugs on human tissues, without a whole human involved, can save money, time, and lives. A fast new system that makes ultra-tiny human blood vessels could change the way we test drugs. Someday it could even help us quickly build organs. Scientists from the Pratt School of Engineering at Duke University have published, in Scientific Reports, an innovative way of making blood vessels. This is more complicated than it sounds. Blood vessels are not simple things which can be described by that infamous phrase, “a series of tubes.” Each blood vessel is a layered structure, and those layers interact with each other. Making both of the layers can take weeks. The new technique can make them in hours. The innermost layer is the endothelium. Endothelial cells are able to rearrange themselves, charting the “route” blood vessels take. The endothelium is surrounded by the media—a layer of smooth muscle cells that can constrict the blood vessels restrict blood flow or dilate it to let more blood through. This technique makes both. The first trick is suspending cells in collagen gel. 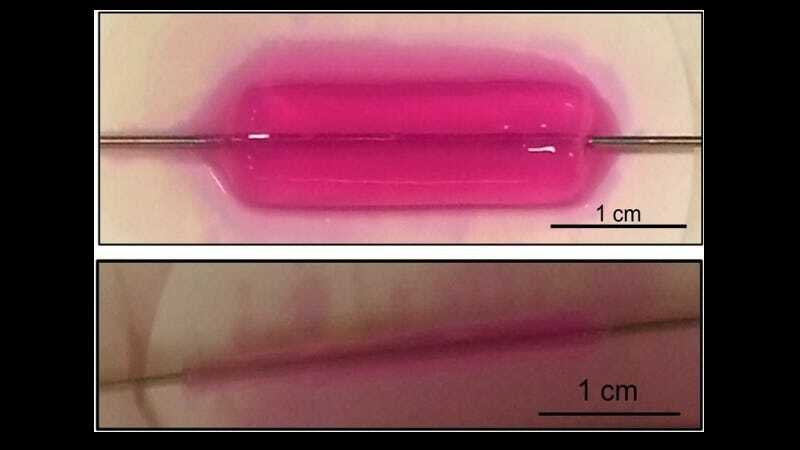 The picture above shows the cells suspended in a tube of collagen. It also shows the next step of the process—removing most of the water inside the collagen. This compresses the cells, and strengthens the resulting artificial blood vessels. The second trick is shrinking down the entire process. Making blood vessels smaller than actual human blood vessels allows the scientists to take the blood vessel from goop to testable in just hours. To make sure the vessels reacted the normal human blood vessels do, the researchers started the testing process with known drugs. They tried exposing the vessels to acetylcholine, a drug that dilates blood vessels. The vessels dilated. They exposed it to phenylephrine, a drug that causes vasoconstriction. The vessels constricted. The vessels also reacted as they “should” to drugs designed to decrease inflammation. The researchers now want to see if cells with specific genetic diseases will react to drugs the way they do in human bodies. If they do, it’s possible that these fake blood vessels could be an way to test new drugs before recruiting human subjects.